What a brilliant - and simple - idea. Playing out. Children playing in the streets. As children did, including yours truly, before the Culture of Fear (and its army of profiteers) clenched its fist around our societies. Playingout.net is the website. This is the film about it. Transforming the streetspace into playspace. "When we limit our children to organised activities and formal playspaces we reduce their opportunities for play. Particuarly the kind of free play that develops really important life skills, their physical well-being and their sense of belonging." The faint of heart and safety nannies alike should refrain from watching this. It features not only rational dialogue and sensible parents but also children playing happily in all manner of 'extremely dangerous' situations. I spotted dozens of children inhaling chalk dust, a great deal of 'irresponsibly unprotected' skateboarding, scootering and bicycle riding, at least one spine-threatening backflip and numerous tubs of water in which the entire population of the street could drown. Roald Als. 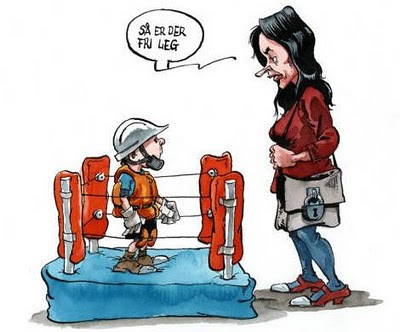 Cartoonist at Politiken newspaper. "Now you're free to play"